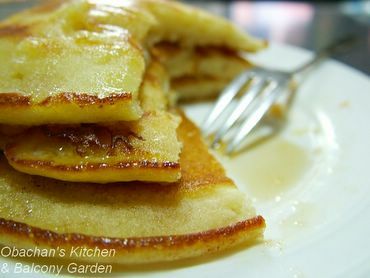 I like making them from scratch, but I have to admit that I keep some Morinaga Hotcake Mix on hand when I need to cheat. 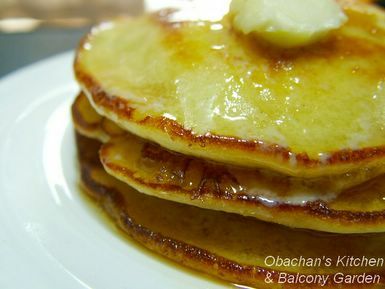 The golden brown edges on your pancakes look so delicious I just want to take a bite! I love it when pancakes have the crispy brown edges on them like that. Yum! Yum! You pancakes looks absolutely yummy! :) Did you use any syrup on them? Like maple syrup or honey? I'd love mine with honey! OH, you can get that Morinaga stuff over there? For me their hotcake mix is too sweet… Actually I consider Japanese “hotcake” and American pancakes as two different things, and I don’t feel like eating hotcakes for breakfast. Yep. Lightly crispy edges and fluffy inside… Mmmmmm…. Yeah, I used maple syrup this time. (It’s just hard to see in these photos.) Yum! pancakes are my favorite breakfast (with maple syrup, of course)! Oh, and maple syrup is expensive in Canada too. My family always used "pancake syrup" (imitation maple syrup) instead. I know. Look at the melted butter running down the pancakes… I believe the fat all went to my thighs. But I'm glad to know skim milk powder could be substituted. I'm actually not sure if it is a good substitute. Tell you the truth, I've never tasted REAL buttermilk pancakes before. So I cannot tell how different or close my skim milk powder version is.